Caption slip reads: "Photographer: Mitchell. Date: 1956-05-03. Reporter: Reay. Assignment: Master plan shoreline. 27: Drawings. 28: Same with Tracy Abell, city planning architect who handled project. 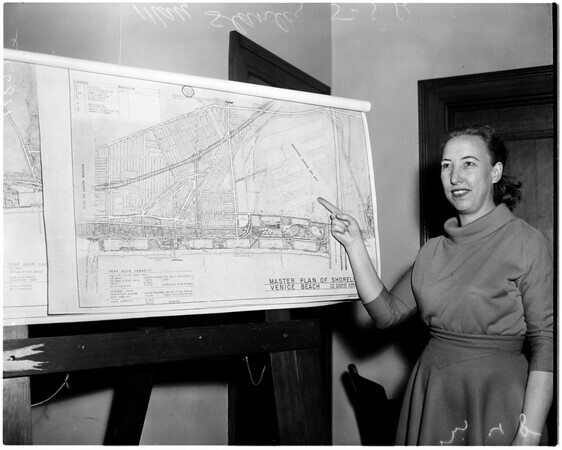 47-48: Mary Stanley of Planning Department with map of proposed improvement of Venice Beach area. 27: Drawings: upper left: Fresh water pool and terrace lower left: Open air theater, restaurant and boat house on a fresh water lagoon (Grand Canal restored) upper right: Typical concession snack bar (once called a hot dog stand). lower right: Aquatic stadium at Venice".